The property mogul faces big-league conflicts as the U.S. president-elect. The same goes for his potential Cabinet of vulture investors and CEOs. Trump wants to put his business into a family-run blind trust. It’s an inauspicious way to fulfill his pledge to clean up Washington. 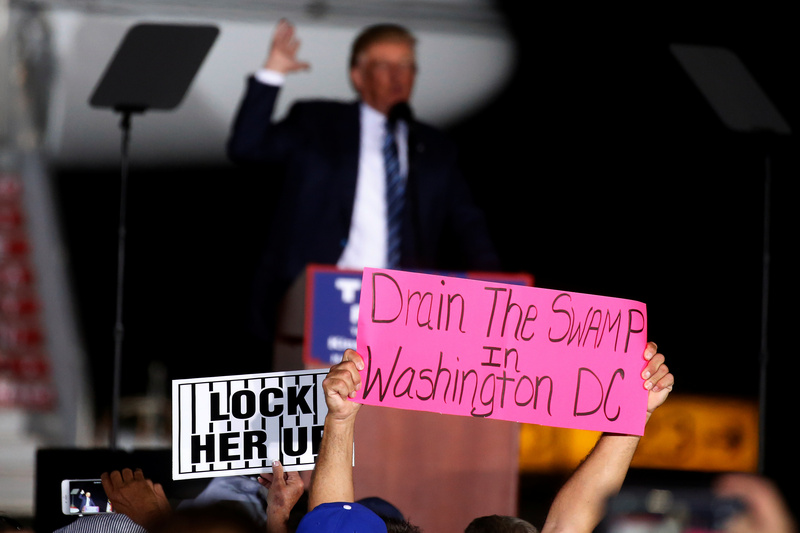 A man holds up a "Drain the Swamp in Washington DC" sign as Republican presidential nominee Donald Trump attends a campaign event on the tarmac of the airport in Kinston, North Carolina, U.S., October 26 2016. U.S. President-elect Donald Trump plans to put his business of hotels, golf courses and condominiums into a blind trust that will be run by his three eldest children, Donald Trump Jr., Ivanka Trump and Eric Trump. Eric Trump said in a "60 Minutes" interview on Nov. 13 that they would not have a formal role in their father's administration. However, they are part of Trump's White House transition team and played prolific roles on the campaign trail. Federal conflict-of-interest laws don't apply to the U.S. president, but his appointees and nominees have to abide by them. Some of Trump's potential Cabinet members are founders of hedge funds and chief executives of corporations. Trump's campaign finance chairman, Dune Capital co-founder Steven Mnuchin, is a leading candidate for Treasury secretary, while Continental Resources Chief Executive Harold Hamm is a possibility for energy secretary or interior secretary.